I found this model while I was tidying up files on my hard disk. 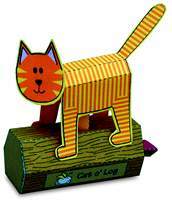 I originally designed the Cat-o-log to be printed in an old Flying Pig catalogue. The model is a pdf file ready to print out. That’s great enough for me! That’s great enough for me! Downloading! Thanks! I’ve actually had that model right in front of me, on my computer shelf, for quite some time now. Love it! I have done quite a few of your models and this one appeals to me because I am a cat lover; however, I am stymied. It is a simple and straightforward model, but I cannot seem to understand how the "body inner" is meant to attach or how it fits nor can I figure out how to put the "flap" and "fulcrum" in proper alignment. I realize this must make me look like a real dummy, but I have tried several different configurations and can’t seem to put it all together properly. After really, really looking at the instructions and really, really thinking about how it should go together, I got it! I’ll get a couple of phots sorted for the website when I get back to the office. Being from the Logging State of Oregon, I have had great fun with this model.I have made a couple dozen of them. and as I give them away, I ask that all important question "What is this?" Then wait for the penny to drop. Always a hit! but, yes sometimes I have to explain it.